Your Xbox One allows you to integrate cable, satellite, or over-the-air television with a broad range of home theater system configurations. Unlike a traditional console setup, there are a few more details to consider when integrating TV. As with most additions to an entertainment system, there are many ways to add a new device, and the exact details will vary based on your needs and preferences. Be direct. 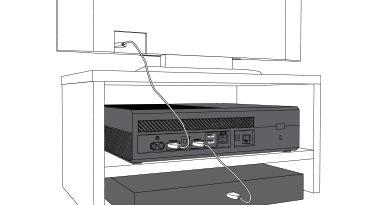 Plug your Xbox One directly into your TV if at all possible. Be simple. The less complicated the installation, the fewer problems you're likely to have. 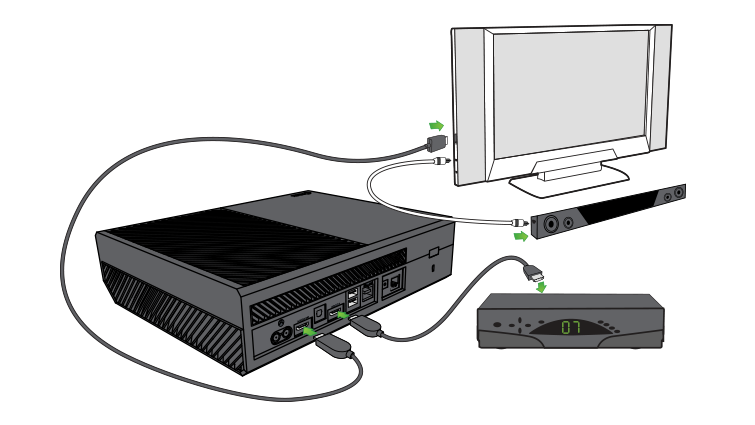 The most direct setup option is to connect your cable or satellite set-top box to your Xbox One with an HDMI cable, and then connect your Xbox One to your TV with another HDMI cable. Note Video output for the Xbox One console is HDMI only. This is the most direct path and best for entertainment systems using the TV speakers or external speakers connected to the TV. Your theater system will need to support audio over HDMI for this configuration. Note In this configuration, Xbox One will always need to be powered on in order to watch the Live TV signal being sent from your cable/satellite box. If you would like to create a situation where you can watch TV through the Xbox OneGuide when the console is on, but also be able to watch TV when the console is shut off, you will need to use an HDMI splitter between the cable/satellite box and the Xbox One. Important The above setup is not recommended, due to the varying quality of HDMI splitters being sold today. HDMI splitters can cause a degradation n signal, HDCP errors, or other issues that might affect your picture, sound quality, and general use of the OneGuide features in Xbox One. Connect your set-top box HDMI output to the Xbox One HDMI input. Connect the Xbox One HDMI output to your A/V HDMI input. Connect your A/V HDMI output to the HDMI input on your TV. This option requires that all devices support audio over HDMI. 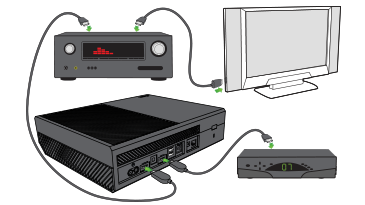 Surround sound from your set-top box will not be passed through the Xbox One. When you perform this kind of basic setup with an A/V receiver, you're passing both audio and video through another device. Depending on your equipment, there's a small risk of audio or video lag. This is a slightly more complicated configuration that may require cables other than HDMI cables. This option provides full surround sound from your TV set-top box. It's best for older A/V receivers that either don't have an HDMI port or don't support audio over HDMI. Connect the Xbox One HDMI output to the HDMI input on your TV. Connect the audio output from the TV to the audio input on the sound bar using either HDMI or optical S/PDIF cables. Press the Xbox button to open the guide. Note Pressing the Xbox button will open the guide from any other screen on the console. Change the audio option from Stereo to Surround sound. Select Restart now. Your console will restart and enable surround sound from your console to your TV or A/V receiver. Would you like to contact Support regarding the "How to connect your Xbox One to your home theater system for live TV" issue you were reading about or a different issue?